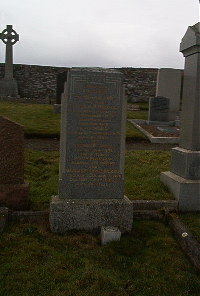 Erected by A G Doull in memory of his wife. Flora H R Malcolm died at Lybster 29th December 1953 aged 73. Husband Alexander Doull died 20th January 1963 aged 87. Cathriona Doull died 15th September 1974 a 3. Daughter Margaret Doull (Pearl) died 29th May 1985 aged 76.